We enjoy learning inside the classroom and in the outdoor area. In our maths area we love exploring all the different maths resources. We can practice our counting with bead, multilink cubes or by singing songs like 5 speckled frogs and 5 currant buns. We even challenge ourselves to add two groups together with moving objects. We also practice writing and matching numerals to the quantity. We look at and arrange shapes and create patterns using resources like numicon boards and pieces. We also look in the environment to see what shapes we can find like a rectangle table or a square window. We have a writing area where we enjoy making marks with a range of writing tools like pencils, crayons, felt tips and whiteboard pens. We learn how to hold a pencil using a tripod grip and how to write our names. We enjoy practicing our handwriting patterns and letter formation. We have a cosy reading area where we love to read a variety of books, including traditional tales. We practice to hold our books the right way and turn one page at a time. We like to talk about the pictures in our stories with our friends and reading buddies. We practice pointing to the words when we are reading and recognise the repeated sentences. We enjoy describing the characters, setting and events in each story and predicting what might happen at the end. We also practice recognising our key words, matching the words in the literacy area. We then challenge ourselves to read and recognise the key words – spotting them when we are reading. Or we can choose one of the nursery rhyme packs – putting the prompts in order and then sing with our friends, taking it in turns. 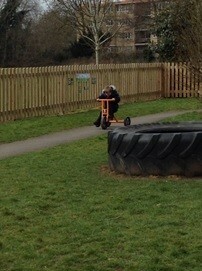 We really enjoy being creative in Nursery. We explore with colours when painting and look at which colour is most appropriate for the picture that we are creating. We practice using tools like scissors by making snips in paper and cutting around shapes. We also experiment how to join materials together using a range of resources like tape and glue. In the sensory area we explore using our senses; to hear and feel. We explore using the instruments and the sounds they make. We practice turning on the garage and cars that make noises. We feel the different textures of the pillows and sensory wall. We have lots of different construction and small world resources. We can build with wooden blocks, duplo, stickle bricks or we can create a marble run. We investigate how to build and make the construction resources balance. We work together to make a train track and play with the cars on the car mat. We explore the small world people and animals, and use the farm too. We look at the world map and identify the different countries and animals that live there. We also explore with torches – being able to turn them on and making shadows. 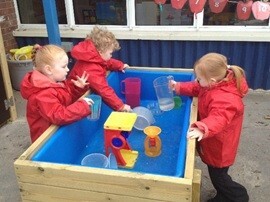 We enjoy coming to Nursery each term to find out what our role play area has turned into. We use props and resources to let our imagination go. We enjoy spotting shapes in the environment and practicing our counting within the area. We also practice our writing and mark making following the tasks set like drawing what we can see in the space station role play area. We share and take turns with the resources with our friends. We also enjoy dressing up as different characters and pretend to be someone else. We have two guinea pigs in Early Years. We take it in turns to look after and care for them. We learn how to show care for the animals and what they need to eat and drink. We enjoy learning outdoors. We practice putting on our coats independently before going outside. There are lots of areas in the garden to explore and investigate. We enjoy taking clipboards out to look for mini-beasts and draw observational drawings of the garden. We practice taking turns and sharing the bikes and scooters. We also learn how to climb and balance safely when on the castle. Read with your child everyday – your child will be sent home with a reading book which they can change once they have read it. They can also take a bedtime story from the reading corner. Practice your child’s key words – match the key words and begin to recognise the words in their reading books. Practice with your child to write their own name. Practice counting - Count objects like the number of stairs or the number of knives and forks on the table. Spot shapes in the environment on your way to school. Each week there will be speech bubbles out in the classroom for you to tell us what your child has been doing at home. This is a great way for your child to recognise the home school link and talk about what they have been doing at home. We look forward to seeing your comments.